1. Click on “GET YOUR TICKETS NOW!” to order online. 2. 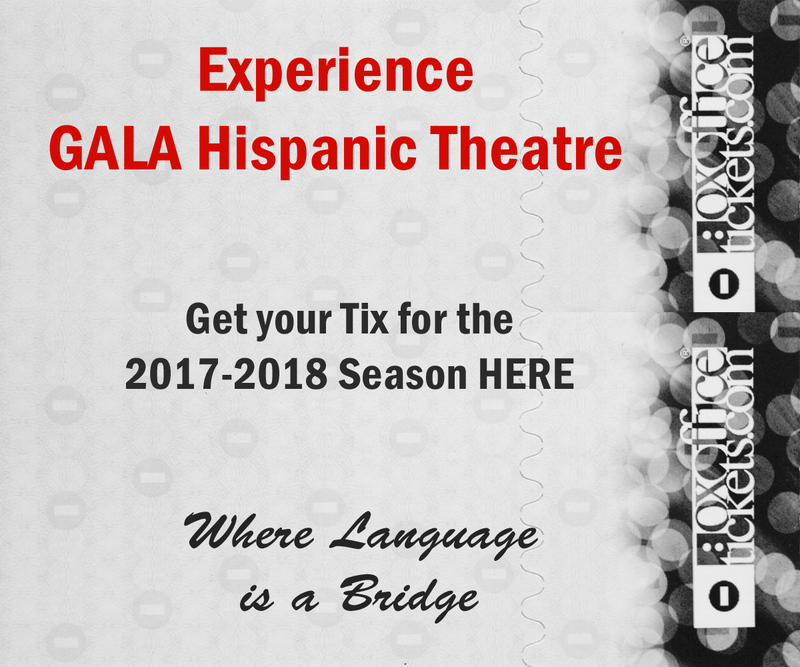 Call GALA’s Box Office at (202) 234-7174. 3. Visit the Box Office (3333 14th St NW, Washington, DC 20010) in person during performance weeks: Thursdays-Fridays 6:30 pm-9 pm/Saturdays 2 pm-9 pm/Sundays 12 pm-4 pm. What are GALA’s telephone Box Office hours? Can I get reimbursed if I decide not to attend a performance and I have already paid for my ticket? All Subscription and Ticket sales are final and there will be no refunds. However, you may get credit for another performance within the season. What should I do if I am going to miss my scheduled performance or need to exchange tickets? You can exchange your tickets free of charge and reserve seats for another performance up to 24 hours before the performance originally scheduled. Please call 202-234-7174 to exchange your tickets. Are there any date restrictions on ticket exchanges? The only restriction on ticket exchanges are for tickets to Noche de GALA and Press Opening, which is the first Saturday evening of each main stage production. This is a really fun evening with a reception with the cast and creative team immediately following the show. Patrons are welcome and encouraged to attend this event. Please call GALA offices for more information about these events or click here. What if I missed my show and forgot to exchange my tickets? Call the Box Office (202-234-7174) on the day of your scheduled show to let us know you won't be attending. On the day of the performance that you wish to attend in lieu of your original date, call 202-234-7174 to check seating availability. We are not able to reassign you seats at this time, but can provide you information about current ticket availability. Arrive in person at the Box Office at least a 1/2-hour before curtain time. Once all the ticketed patrons are seated, you will be seated in any remaining empty seats on a space-available basis. If you have any other questions, contact GALA at (202) 234-7174 or email info@galatheatre.org.